An extremely dated exercise in unwavering linearity, …Iru! is only interesting when contrasted with better games. I have a huge collection of obscure horror games that I have amassed over the years. Most of them are Japan-only PS1 releases, and these days they are neigh unplayable. They are so old and clunky that sitting through them is a serious test of my patience. But I keep them around and try to play one through every once in a while because occasionally there is a gem hiding in that geriatric pile. Titles like Hellnight and (I’m told) Overblood 2 are examples of games that still have a lot to teach us about horror design. 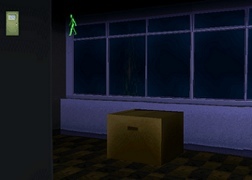 Every time I buy an old horror game I hold out hope that it’ll be another Clock Tower: The First Fear, an interesting take on the horror genre, something that forces me to adjust my assumptions about what horror games are. A little stroke of genius just waiting to be discovered. Unfortunately, …Iru! is not one of those games. …Iru! 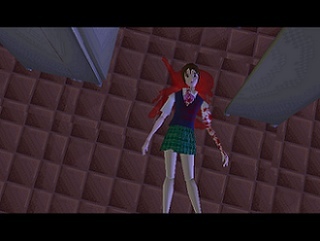 is a first person 3D horror game for the PS1 made by Takara in 1998. The title roughly translates to “…something’s here!,” but the word is so generic that it befuddles most search engines. Iru takes place in a high school that features a large mechanical clock in its center. A number of students who’ve stayed late to finish preparations for a school festival find themselves locked in one night, and soon the bodies start to pile up. The intrepid protagonist, a stoic upperclassman, must figure out what’s going on and try to save his girlfriend from the grips of the nefarious entities vaguely referenced by the game’s title. The game is a first-person exploratory adventure game; you walk around, collect items, and occasionally solve puzzles, but there’s no combat or any other form of action sequence. That short description probably gives you enough information to guess at Iru’s gameplay. You solve some puzzles, unlock some doors, explore the school, talk to people. Boilerplate stuff, pretty standard for this kind of game. But as routine as this may sound, Iru manages to screw it up in a way that gives me new respect for other adventure games. Iru’s major flaw is that it refuses to give the player multiple goals. At any given point in the game there is one operation that will advance the story. It might be talking to a person, or visiting a certain location, or using an item. Whatever the action, there’s only ever one correct action at any given time. You cannot get to point C without passing through points A and B, in that order. This makes Iru extraordinarily linear; there’s no way to actually diverge from the main path because the main path is the only path! While other games in this genre tend to implicitly create short- and long-term goals for the player, Iru’s goals are always immediate: find the next story point. Unfortunately this linear design is somewhat antithetical to an exploration game. What is the point of exploring a space if there is nothing to find? What’s more, the game generally does not give out any clues about where you should go next. You find yourself somewhere in a high school with many rooms, any one of which could contain the next plot point necessary to progress. You could walk aimlessly around for hours and still miss it! That’s not exploration, it’s a waste of time. Iru is at its worst in the first hour or two. The purpose of this segment is to set the characters and story up, and it involves talking to various students and faculty in sequence. But of course, you can’t know where those people are, so mostly this hour consists of visiting each room over and over again until you find the one that has somebody in it. The game gets a tiny bit better as it goes on because the plot begins to provide more specific goals, but it’s still extremely tedious. In my Silent Hill Downpour review I noted that nobody wants to search for needles in haystacks in video games because it’s just not fun. Iru, unfortunately, is entirely structured around just such an operation. The real-time 3D engine behind Iru must have looked pretty bad even in 1998, but by today’s standards it is absolutely horrendous. The sound is poor but sometimes unintentionally hilarious, and the controls are bad but serviceable (thank goodness they included a run button). Iru’s story is fairly random and nonsensical, but it doesn’t matter. There are only about ten puzzles in the entire game, but it took me close to eight hours to finish; that should give you some idea of how much time you spend just walking around. There is one thing I liked about Iru, and that’s its hiding mechanic. 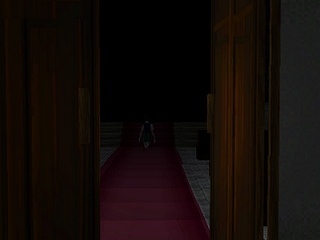 Every once in a while (maybe three or four times over the course of the game), an enemy will chase you into a room and you’ll have a limited amount of time to hide before they kill you. 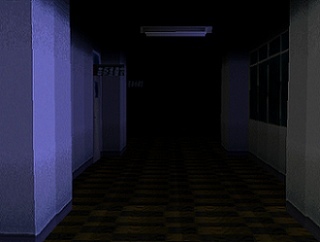 You’ll hide in a locker or a cardboard box or something, and then a cutscene will play that shows the enemy walk in, look around, and then leave. Though simple, these sequences are when the game is at its peak. There is a nice graphic at the top of the screen that shows the enemy approaching, and despite the general low quality of the game, the time pressure makes it click (if only for a minute or two). Unfortunately these sequences are scripted and only happen a few times throughout the game. What is the value of playing old games like Iru? The game itself has almost nothing to teach us; everything it does has since been done more effectively by better, more widely-known games. Nor is this one of those “almost genius” titles that occasionally stuns us with flashes of brilliance. It’s just an old game, weighed down by dated conventions and flat-out bad design. What can we possibly learn from it? I am a firm believer in the idea that every failure has something to teach us. In this case, Iru’s absolute linearity has made me appreciate the way that Resident Evil, Silent Hill, and every other good horror game ever uses layered goals that operate over different terms. If nothing else Iru has got me thinking about systems in better games that I have thus far taken for granted. It is a sharp contrast from many better games, and that contrast is good meat for study.